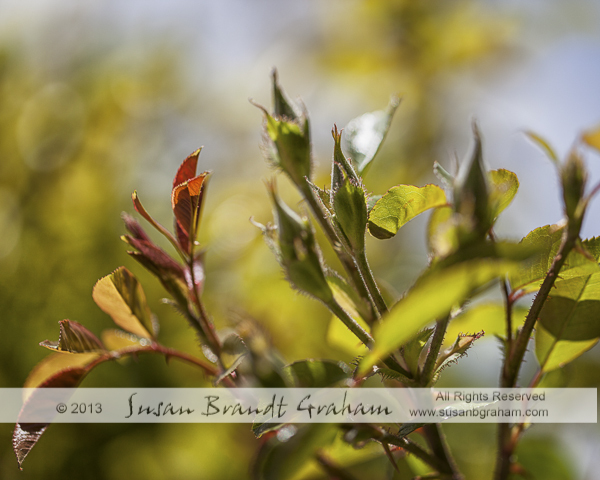 Green Rose really is a rose. It is a sport, or a mutation, made up of sepals. 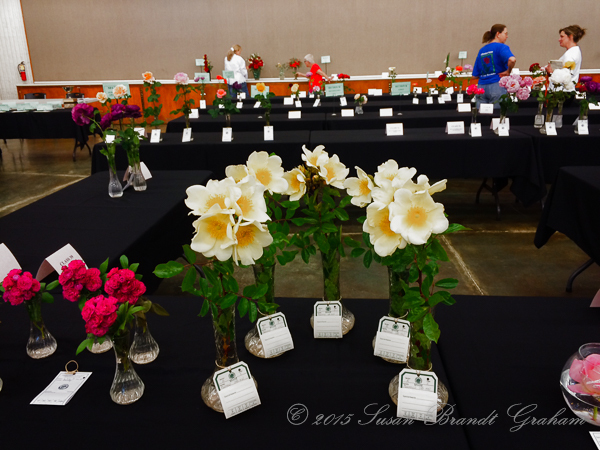 Its official American Rose Society color is “white,” something of a trick question on some of the practical exams to become an ARS Accredited Horticulture Judge. I have never seen this white part, but it doesn’t matter. I enjoy having this rose in my garden. Not only is it interesting just to look at, but rose arrangers find it useful as line material in rose arrangements. In a previous post I mentioned the discussion among friends regarding editing of images, and the use of jpg versus raw files. Here I would like to briefly mention composition. 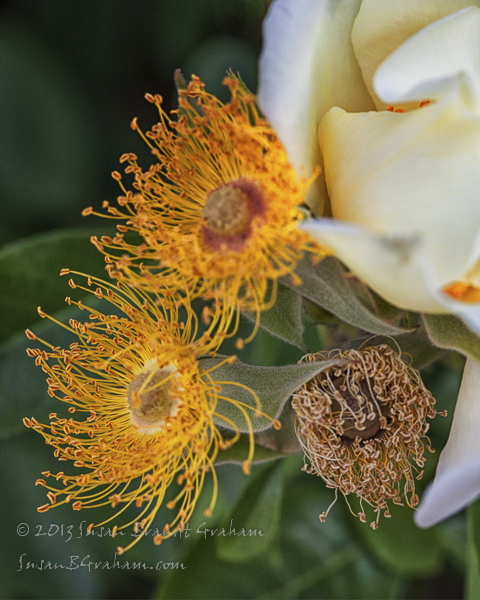 Rule of Thirds can be a very useful composition guideline in floral photography. Those of you who read here frequently know that it is a guideline I use in a wide variety of my photography. 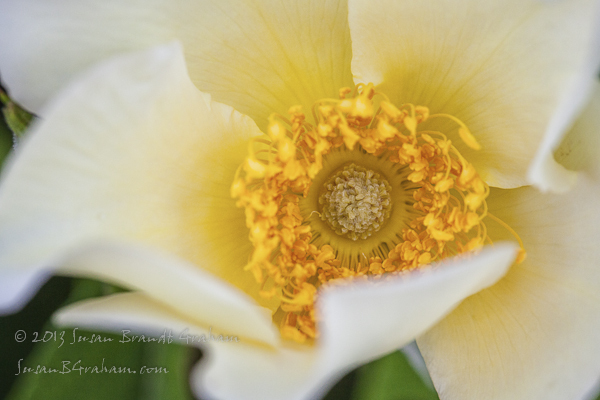 When photographing rose sprays, however, my personal preference for my own photography is symmetry and balance. I like to show the structure of the spray, and tend to photograph sprays from that perspective, rather than from the top down. To my eye, symmetry and balance is a good way to show both the structure and beauty of rose sprays, at least in many instances. This image of the Green Rose uses symmetry and balance. 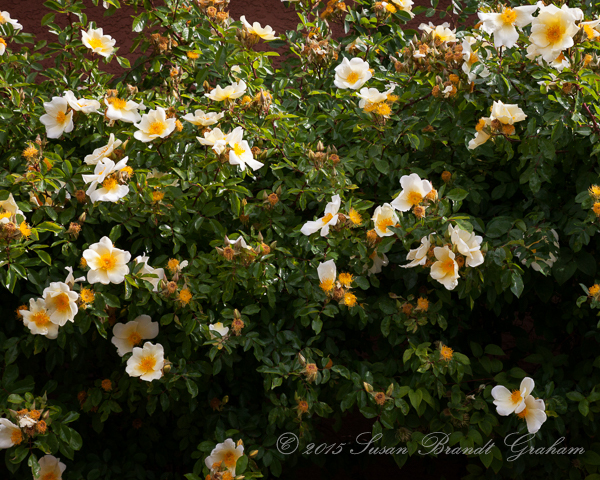 Spray of rose, ‘Dream Weaver.’ Image awarded ‘Queen’ (Photography) at the ARS Fall 2014 National Convention. Green Rose, one of the unique roses in the roses in the rose world. 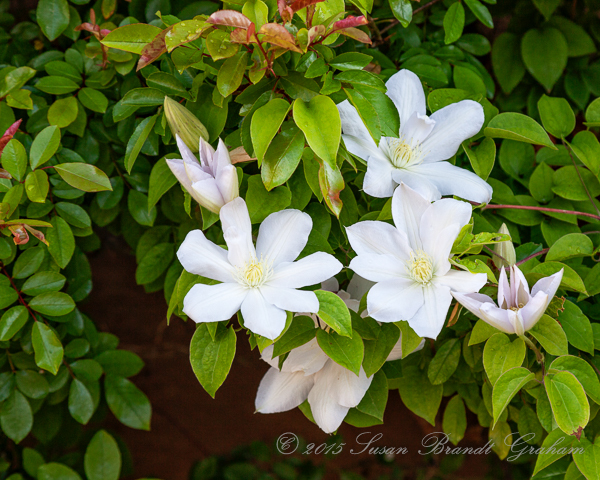 Clematis and Mermaid make great companion plants. I have already shown this year’s ‘Nelly Moser’ bloom with ‘Mermaid.’ ‘Nelly Moser’ is the first to bloom. As that bloom comes to an end, a white clematis, whose name I do not know, begins its bloom. 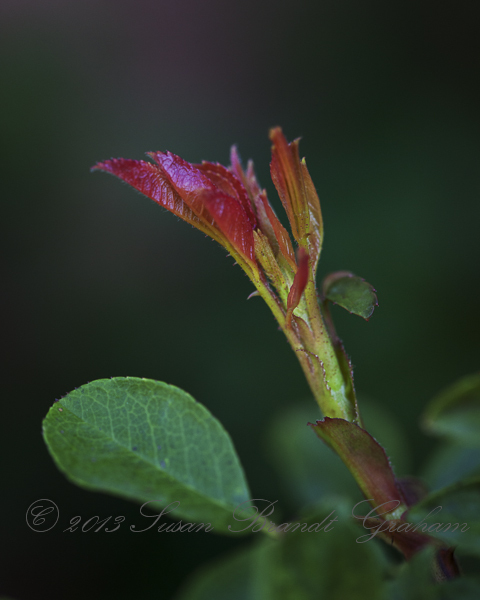 About the time that bloom comes to an end, ‘Mermaid’ will begin what can be a spectacular spring bloom. 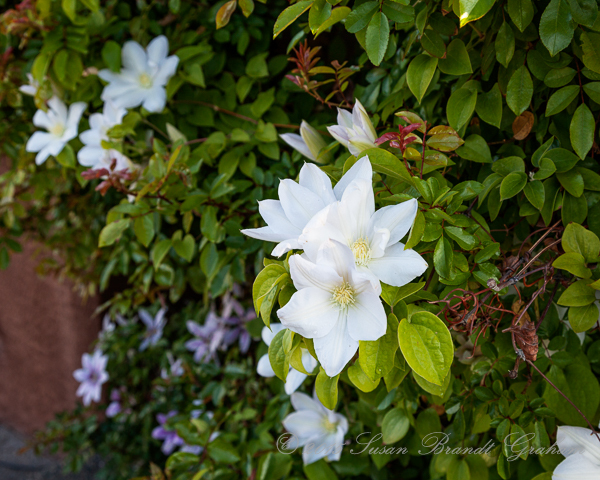 The white clematis is reaching the peak of its 2015 bloom. 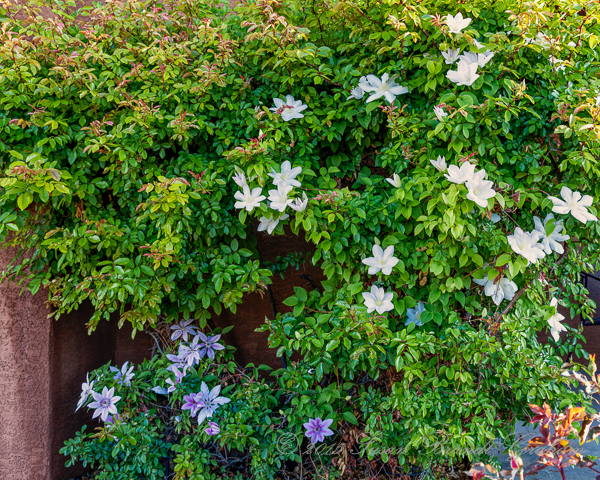 Clematis needs “cool feet” to thrive, along with sunshine on the leaves. ‘Mermaid’ provides shade for the clematis roots, and a strong structure on which the clematis vine can climb. This third view gives you some idea of the size of ‘Mermaid.’ I have mentioned before that I prune it back in the fall (the only rose I treat that way! ), and it has already grown a lot this year. 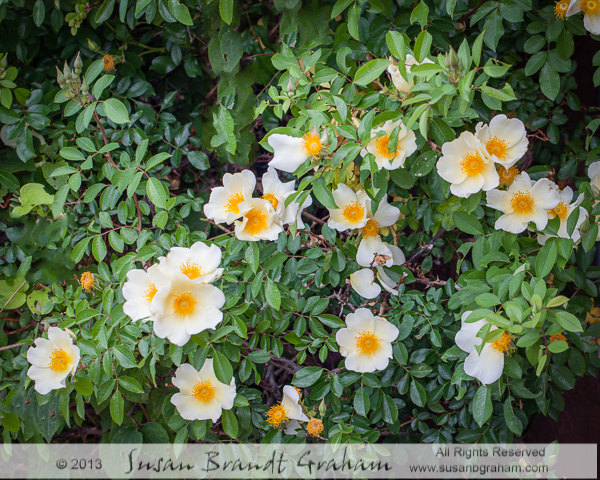 After the spring bloom, I will cut it back again to keep it from filling up the entire yard! 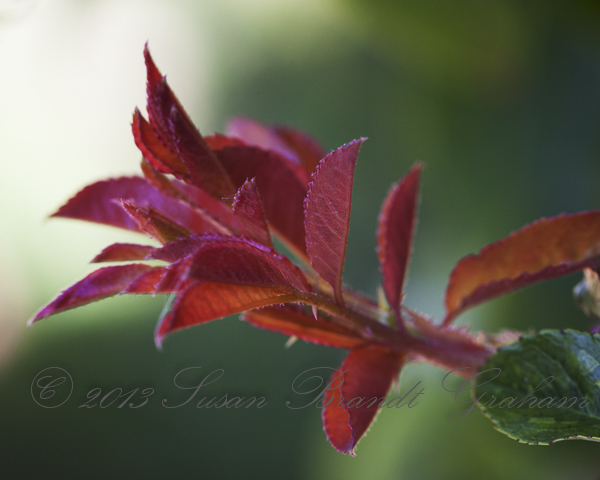 But, I really enjoy growing this rose. ‘Mermaid’s’ 2013 spring bloom was beautiful and amazing. She had more blossoms than ever before, and virtually no thrip problems. 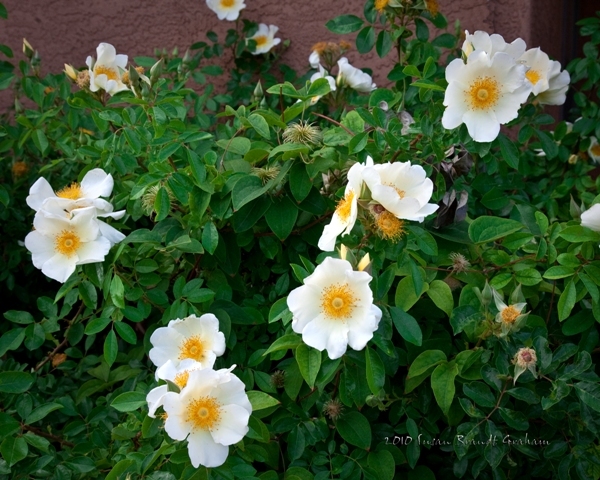 She won the American Rose Society’s Victorian Award at the Albuquerque Rose Society’s Spring Show, and Best of Show (Horticulture) at the Albuquerque Council of Garden Clubs Spring Show. But, more than the awards, she was just a joy to behold in the yard and on the patio. 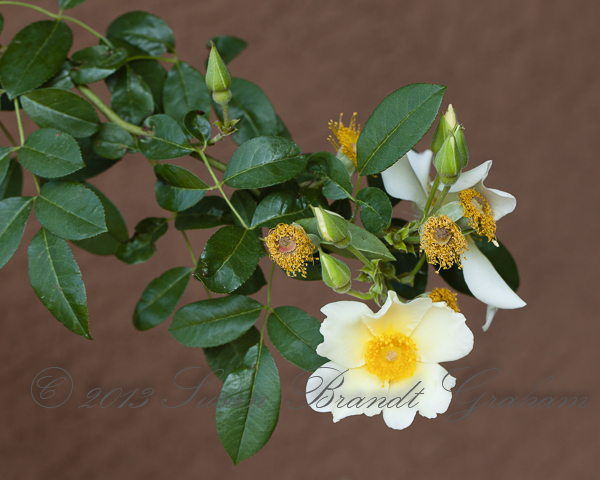 Mermaid can be an aggressive grower, and the last major blooming branch was headed into the patio. This is not particularly desirable, because she has many very prickly thorns. People only half-jokingly say that she will attack anyone or anything that comes close. But, I left this branch until the last bloom was gone. 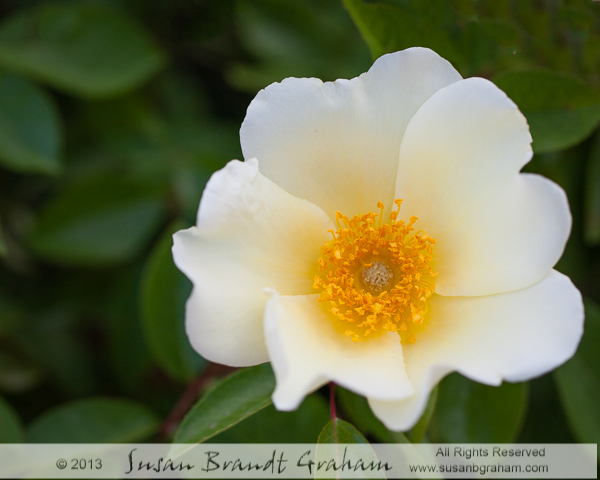 This rose is interesting to view, even when the gorgeous, creamy fresh blooms are gone. 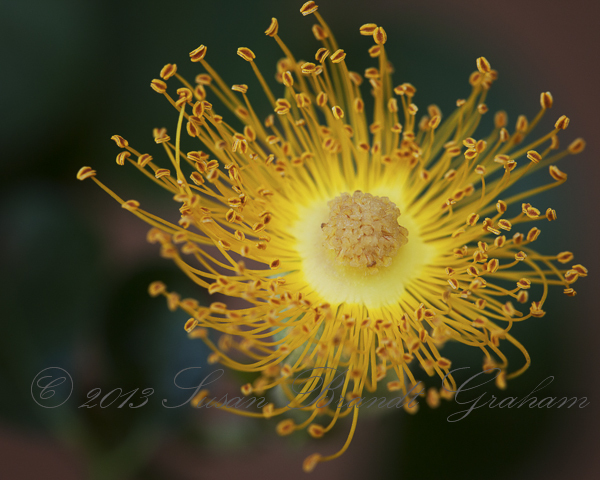 The stamens, bright golden with pollen when they are fresh, hold interest for long after. ‘Mermaid’ seems to be tolerating the Southwest’s extreme drought and summer heat very well. Although the first flush of blooms is now over, she is already putting out new growth everywhere! 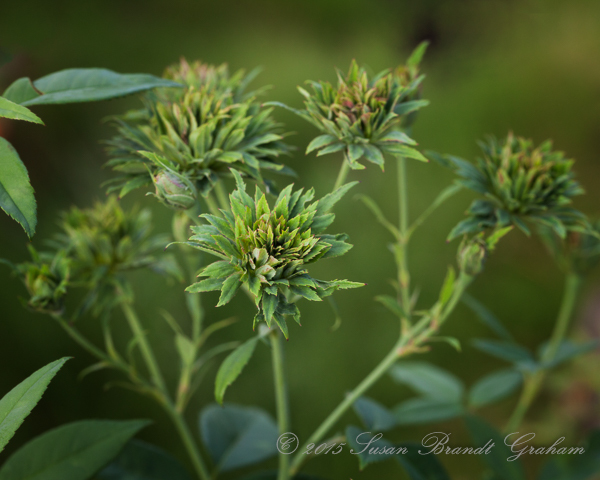 At the rate this beauty grows, it will not be long until there are new blossoms! 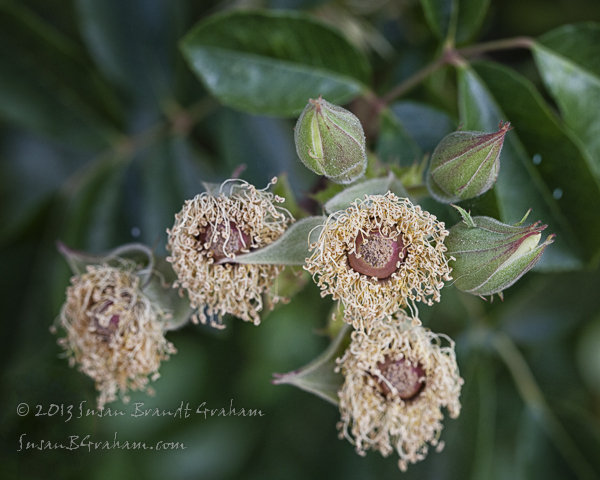 These images show Mermaid on one day, with various phases on the one bush I have. This is a bloom just barely opening in the morning. They open in the morning, and the petals are gone by the next morning. 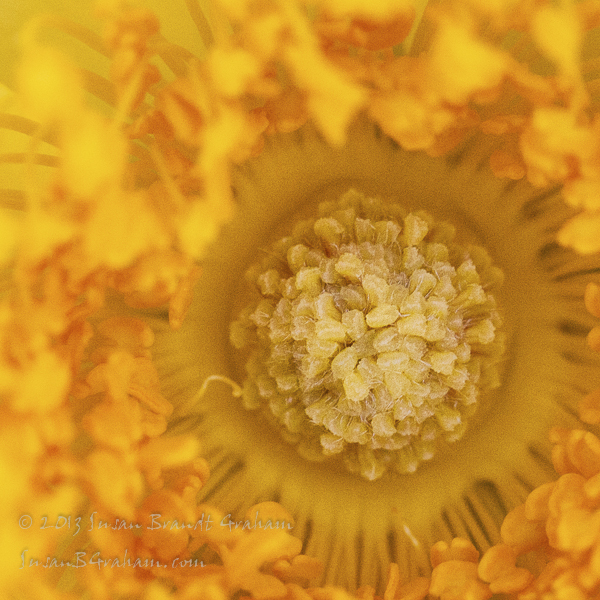 The long golden parts are the stamens, the pollen bearing part of the male plant reproductive system. The center part is the stigma, the visible portion of the pistil, the female plant reproductive system. The stigma is sticky and catches the pollen. Even barely unfurled, Mermaid, to me, is gorgeous. Close up of the stigma (the visible portion of the pistil in Mermaid). It looks very other worldly. On the right is a bloom starting to unfurl. The spent bloom in the lower left has just lost its petals. The one in the middle is about 48 hours old. I cannot tell how old the one in the lower right is. 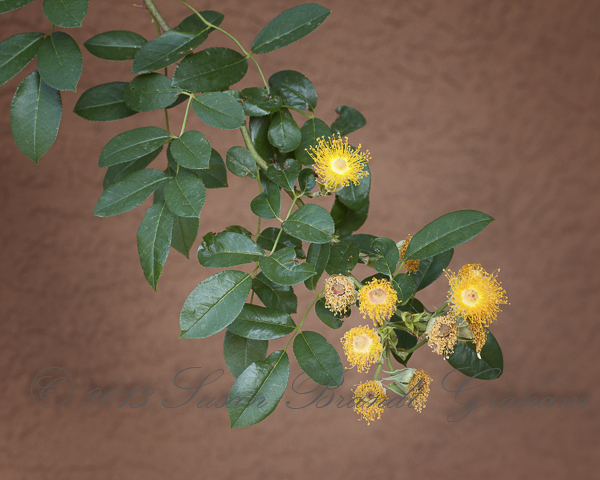 These are actually on two different branches – one with the buds, one with the spent blooms. 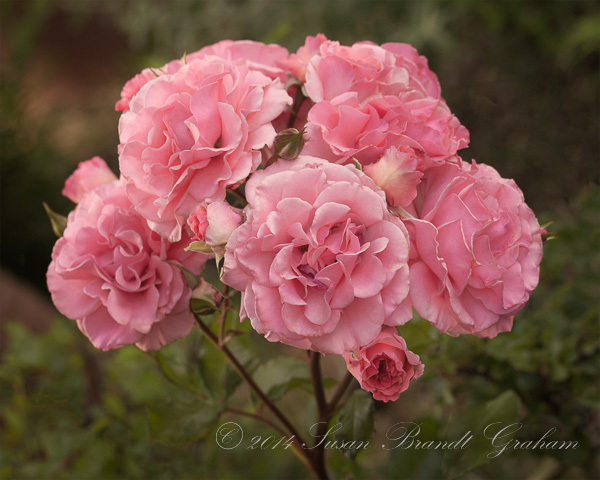 Mermaid was awarded the ARS Victorian Award (best old garden rose with unknown date of origin or introduction in or after 1867) this year at the Albuquerque Rose Society Spring Show. She won Best of Show in 2006 and 2010, but this year she did not hit her peak until after the show. The glory of Mermaid for me is in the garden! Sharing her with others at shows is fun. Any awards are just a bonus for this beautiful rose! 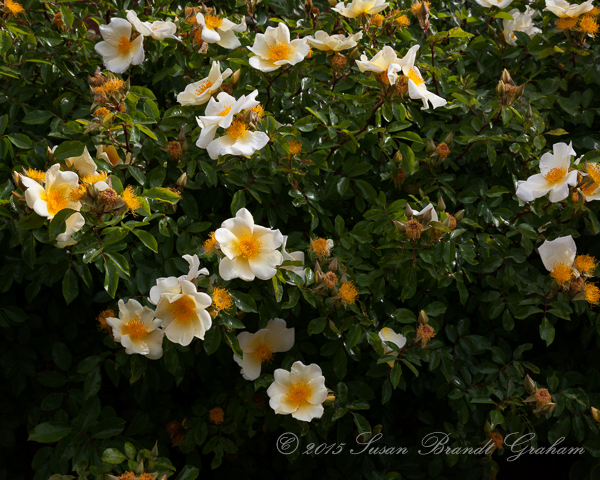 Over the past several years, I have documented ‘Mermaid’ as a beautiful Old Garden Rose (hybrid bracteata) introduced in 1918. 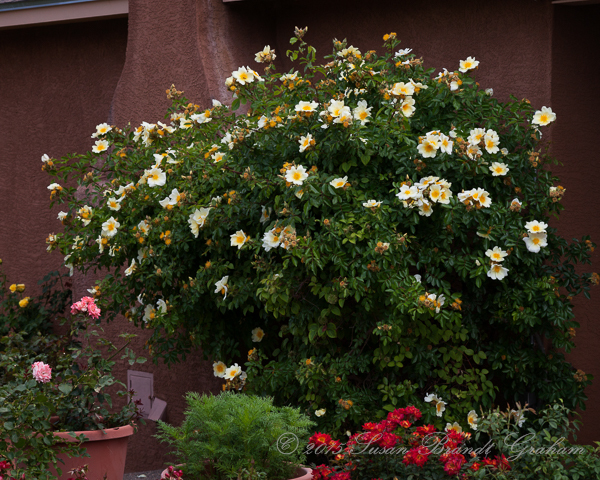 She was up to my roof, and in May of 2006 won “Best of Show” in the Albuquerque Rose Show. You have seen that “The Big Snow of 2006” almost totally destroyed her, and she had to be cut off at the ground. She has very slowly come back. She is not yet up to the roof, but this spring she is blooming as beautifully and prolifically as when she was in her prime. She just won the ARS Victorian Award for best OGR introduced after 1874, as well as Exhibitors Dream and BEST OF SHOW at the Albuquerque rose show June 5. This really is a rose, officially a China. 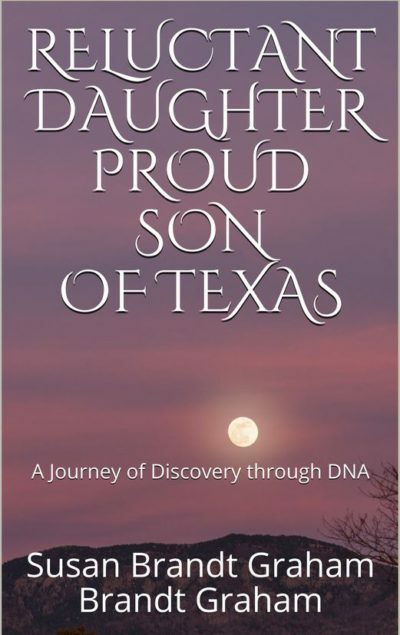 In rose shows, it is eligible for the Genesis Award. 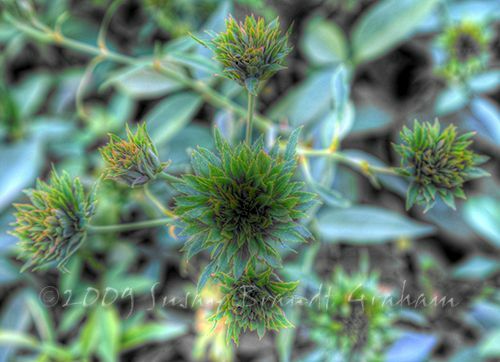 The cluster of green you see are really the sepals. I have been told there are true flowers deep inside the cluster of sepals; I have never seen one. 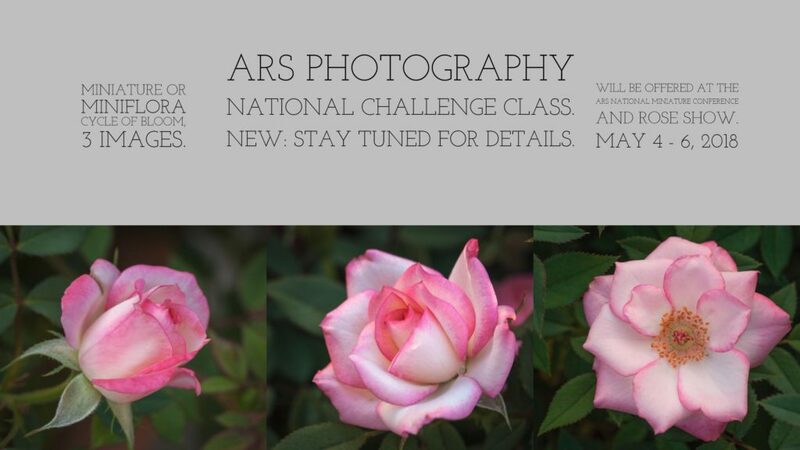 When I took the test to become an ARS Accredited Rose Judge, one of the questions was “What is the ARS color of the Green Rose?” There is no ARS color “green,” so I answered “no clue.” I think I was given partial credit for that answer. 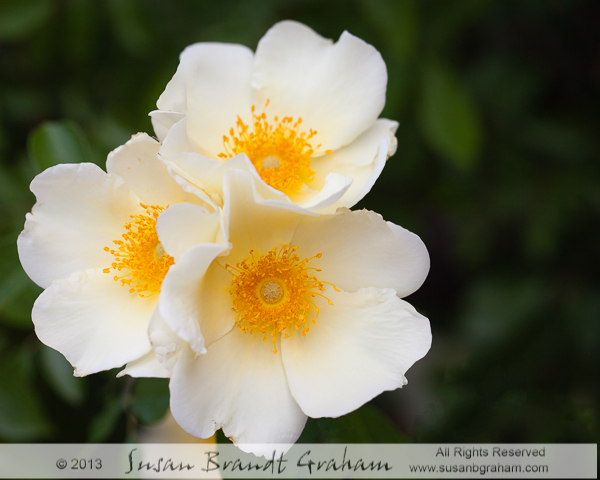 The official color of the flowers of the Green Rose is “white.” Just some rose trivia.